how is a tent on your trunk a good idea? 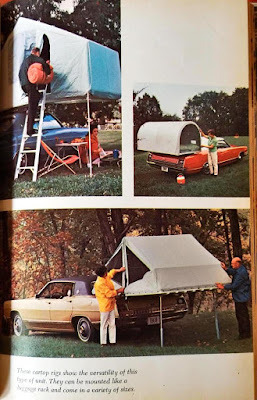 The most fascinating thing looking through old camping books of the 50's and 60's was the cartop tent. The old versions were literally plywood boards with a tent attached- evidence in the photo from the "Ford 4 Seasons Adventure Library" book on the left. Some of them would even go on your trunk (which immediately meant you couldn't get into the trunk if someone was in the tent, or even once the tent was attached to the trunk, which is why I don't think those sold very well at all.) By the 80's they had disappeared, so I never saw one in the wild. I saw pup tents, Airstreams, tent trailers, Six-Pacs, Minnie Winnies, converted school busses, mega-tents and dozens of other devices, but never a cartop tent. Cartop tents are back now, if you haven't noticed while thumbing through the latest issue of Outdoors magazine or looking at your REI email blast. They're everywhere you look, and they're still fascinating. The idea is still the same: a tent on the roof of your car. These new versions look like telescoping roof racks with a tent attached. But the same major problems still exist. Number one is getting in the tent. Since it's still on the roof of your car, you still need a ladder or something that is not called a ladder but it structured awfully similar to a ladder. Problem 1A, closely associated to getting into the tent on the roof of your car, is getting out of the tent on the roof of your car. At night. In the dark. When you have to pee. After you've had a couple of drinks. Yeah. 1A is an issue. Issue 1B is getting your dog, who sleeps next to you- I'm assuming I am the only person who does not take a dog camping, because that's how it seems to be- up a ladder and into the tent on the roof of your car. If you have a small dog this is not a problem. But I have not seen too many people take small dogs camping. And if you're unsteady getting in to the tent on the roof of your car, how is your dog going to like getting there? Problem 2 is the same one you get with any sleeping arrangement on wheels. When you move, the RV, trailer, van, car- whatever- moves too. Now imagine you're in a tent on the roof of your car with your significant other and your dog, and you all move. You might as well be on a houseboat. Problem 3? I go camping to not be attached to a car. I go camping to sleep outdoors near the river, not on my car in a parking space. I might as well sleep in my driveway. Problem 3A? Your vehicle has to be on flat ground for you to sleep, and I mean really flat ground. I don't think you're going to want to take the chance of falling out of your tent- and five feet to the ground. Which comes to the only bonus about sleeping on my car: when it rains, and there's mud, I'm not on the ground. That's it. But when it rains and I'm camping, I tend to pack up and head home. 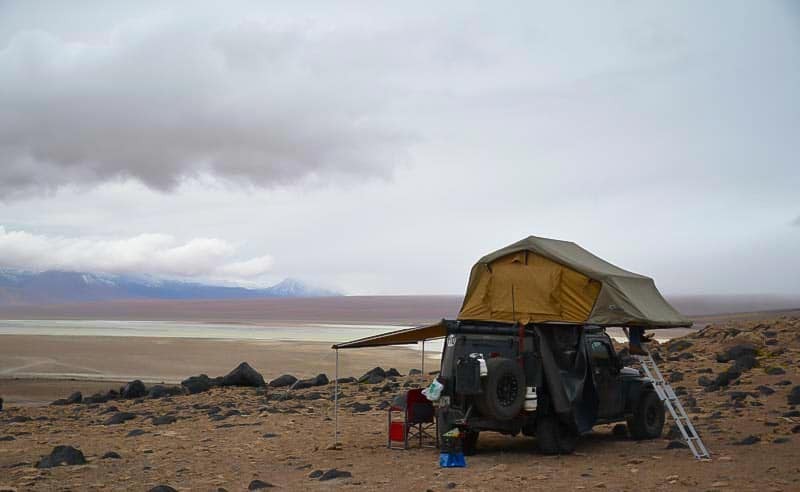 So they can dress up rooftop tents or cartop campers as much as they want, and have them look as cool as they want.... but they're still a bad idea (unless you are running a safari in sub-saharan Africa on an expedition looking for big animals that could very well kill you if they found you while you were asleep. But let me remind you those animals can climb ladders). Let me know if I haven't thought of a really good reason for sleeping in a tent on the roof of my car. It seems to me the modern rooftop tent will go the way of the old cartop camper. Plywood not included. wait, a tent... and another tent?